The race has intensified to develop a commercially viable banana resistant to the latest virulent strain of Panama Disease amid mounting concerns that the world’s most popular variety, Cavendish, could meet the same fate as its predecessor Gros Michel. 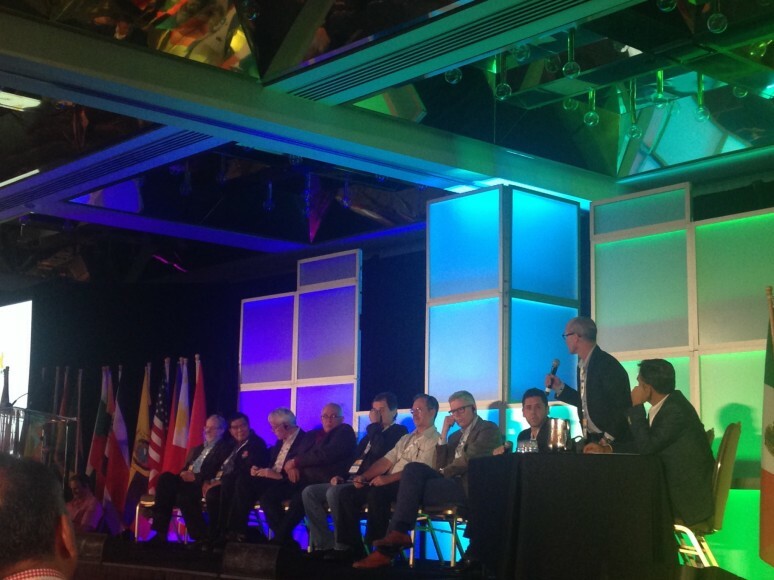 The decision by Corbana and Acorbat, to join forces for the first ever joint International Banana Congress, held in Miami this week, was a show of unity against a common enemy: With Tropical Race 4 no longer confined to South East Asia, it is clear that a coordinated global strategy is the only way forward. Seeking to dampen some of the more sensationalist headlines of recent weeks, the message from Miami was loud and clear: there is much that can and is being done to contain the current TR4 epidemic while a long-term solution is sought. Unless and until a replacement is found, avoidance and containment through effective quarantine procedures and integrated disease management strategies are the best forms of control available to the industry. This latest strain of the disease was first reported in Taiwan in the 1960s and went on to decimate the country's banana industry. Since the 1990s it has been spreading at an alarming rate, firstly through South East Asia and more recently between continents. It is now present in several countries outside the region including Mozambique, Oman, Lebanon, Jordan, Pakistan and Australia and fears are growing that it will soon reach Latin America. During the course of the three-day event delegates heard from a series of experts on how advances made in screening, diagnostics, conventional breeding and transgenics are helping in the fight against TR4. Dr Randy Ploetz of the University of Florida set the scene with an analysis of the current status of what he described as a particularly pernicious disease in which the pathogen can spread undetected for prolonged periods and awareness among growers is still alarmingly low. He said much more research was needed into its epidemiology in order to establish how it is spread and where the next outbreak might occur. According to Dr Gert Kema of Wageningen University and Research Centre, recent advances in diagnostics such as the launch of the first commercial TR4 analysis kit that allows growers to carry out real-time testing for the disease are a step forward. Faster genetic differentiation tests also mean it is now possible to identify this particular strain of the disease more quickly than before and this also makes containment easier. Chemical and non-chemical control measures are limited and at best only work in the short-term. Ploetz warned against growers placing unfounded optimism on solutions that had not been properly tested and validated, such as managing the disease with healthy soils, biological controls, intercropping and burning rice hulls or bamboo. While all of these measures have been shown to have some efficacy, there is no magic bullet. Instead, Kema said an interdisciplinary approach is required to slow down the spread of the disease, while breeding holds the key to eventually bringing it under control. So far, conventional breeding programmes like the one run by FHIA in Honduras have resulted in the creation of clones with limited tolerance to the disease, but none has been demonstrated to have complete resistance. However, a number of field trials using transgenics appear to have yielded more positive results. James Dale of Queensland University of Technology (QUT) presented the Darwin Field Trial, a three-year study high levels of resistance and in some cases no signs at all infection. Dale predicted that advances in transgenics would turn out to be a game changer for the industry. Techniques such as genome editing, where bits of a dysfunctional gene can be snipped out and replaced with little impact on the rest of the plant’s physiology, would speed up the development process dramatically, he said. More importantly, they could provide a way of circumventing regulatory hurdles governing GMOs and greatly reduce resistance among consumers. “We’re still three or four years away from having something we can bring to the market but this is where the technology is heading,” Dale concluded.